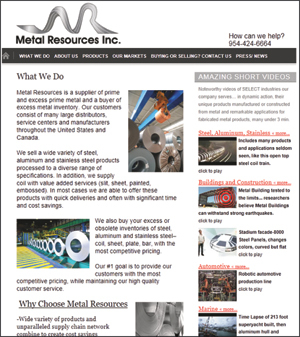 Metal Resources Inc., Ft. Lauderdale, FL, has launched a new website stocked with a series of noteworthy videos highlighting—in unusual s—the many applications for fabricated metal products. Included in the library are videos showing an open-top steel-coil train, architectural-steel building panels that change colors, and a robotic automotive-production line. Metal Resources, which sells to customer specifications, provides coil, plate, sheet and bar in carbon- and stainless-steel and aluminum alloys, and is a purchaser of excess and obsolete inventory.